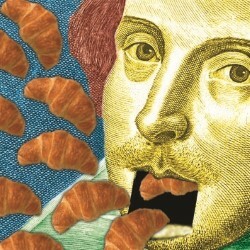 Kicking off this year’s Fringe reviews, we start with a trip out for breakfast on Shakespeare Island. Shakespeare for Breakfast is a Fringe regular, and this is my third visit. Each year, the group present a different show complete with plenty of comic Shakesperian and pop-culture references. This year’s show deviates from previous years as the cast have not decided to go for a straight adaptation of a single play. Instead, many of the tropes and characters from some of the most famous plays are woven together into a new story about the evil characters trying to change the plays to become the heroes. I won’t say much more for fear of giving the plot away. Overall, the story was straightforward, and funny, but it didn’t quite have the charm of the play adaptations in previous years. Amongst those I went to the show with, this was a controversial opinion with some suggesting it was better! However, the writing was still sharp as a tack with plenty of laughs on all levels. I don’t really have a bad word to say about this year’s cast. The play was performed with enthusiasm, which meant even the most weak of jokes still found giggles. There was quite a bit of dual casting, which was part of the comedy, and this only strengthend the performances. As always, you can’t go far wrong booking this show, especially as there is a free cup of coffee or tea and a croissant thrown in. If you’ve seen it in years before, you may feel it’s not up to usual standards, but I wouldn’t let that put you off a thoroughly enjoyable morning. This entry was posted in Reviews, Theatre and tagged 4 stars, fringe 2014, musical, reviews on 7th August 2014 by .